Originally from Newbury, Berkshire, an Art Foundation Course at Brighton was followed by a Degree in Graphic/ Illustration at Kingston Polytechnic. After graduating in 1987 I became a freelance illustrator working mainly in scraperboard for advertising, publishing, packaging and newspapers. 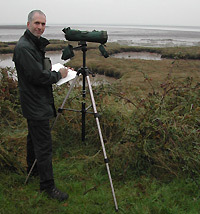 However, my work has gradually drifted towards my main interest of birds and wildlife especially after winning “British Birds – Bird Illustrator of the year” in 1993. 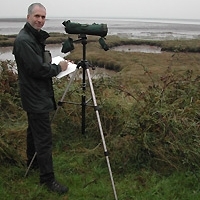 Moving to Essex in 1988, and more recently to Wivenhoe, the bird rich estuaries and marshes of the Essex coast have provided an endless source of inspiration and fueled a passion for field-sketching. I enjoy the immediacy of working directly from nature, trying to capture the life and vitality of wild birds, and the patterns of plumage, light, water and foliage. This essential field experience has proves invaluable when working on paintings in the studio, or when illustrating bird identification guides. Publications include, “Concise Birds of the Western Palearctic”(Oxford University Press), “The Handbook of Birds of the World” (Lynx Editions), “A Field Guide to the Birds of South East Asia”(New Holland) and the solely illustrated “Sunbirds and Flowerpeckers”(Bloomsbury).Such work has led me on exciting trips to China, USA, Southern Asia, Senegal and many parts of Europe and I’ve filled many sketchbooks with observations of wildlife and landscape. This grounding in field is also a considerable help when producing wildlife interpretation illustrations for nature reserves and visitor centres. 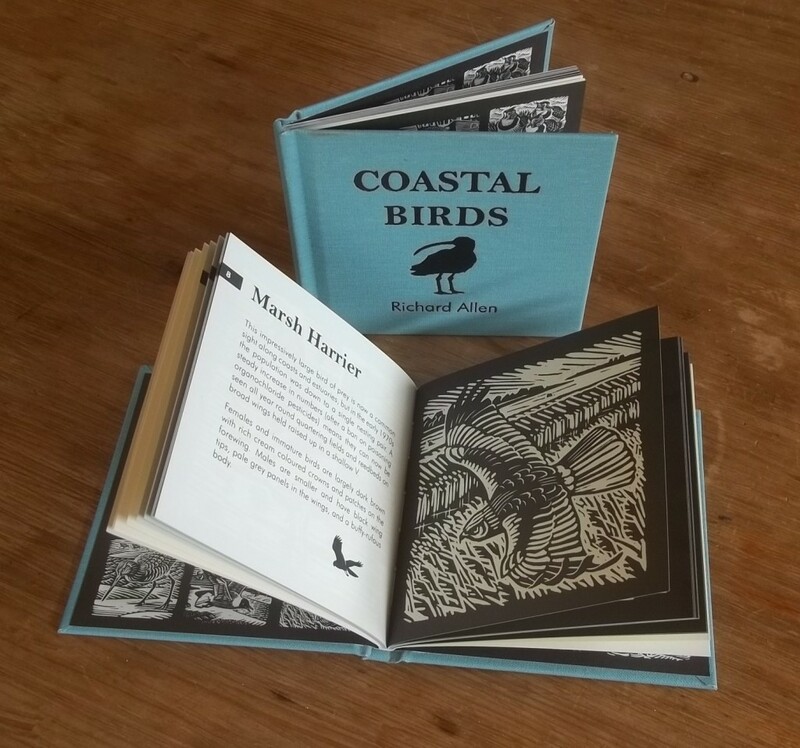 A rounded knowledge of all forms of wildlife is vital when designing complete habitat compositions such as chalk streams, ancient woodland or estuary salt-marsh. 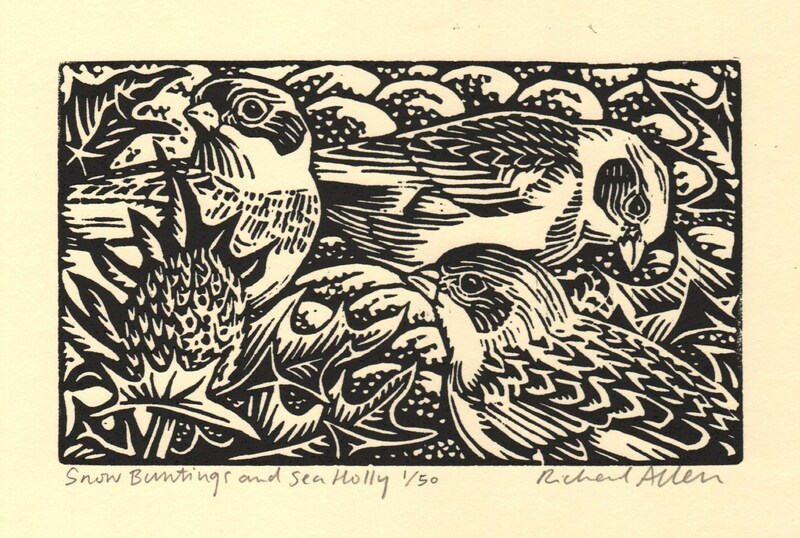 I don’t however confine myself to wildlife and a varied portfolio of work has come my way, from iron-age hill-forts to Olympic stamps, medieval monasteries to a range of TV-related walk maps for the Radio Times. I do always though come back to my passion for studying and depicting the natural environment. After many years working in watercolours I have recently been experimenting with oils, and I’ve enjoyed using a new medium, developing a new style, and revealing in the rich colours attainable in oils paint. 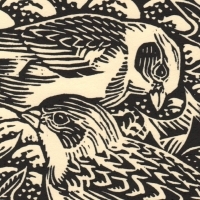 I have also returned to print making and my next book of lino-cuts is now published showing a selection of garden birds. I live in Wivenhoe, on the Colne estuary, with my wife Sally and Buster the border terrier who takes me for walks along the seawall.